On 21 August 2018, the newly elected Prime Minister Mohamad Mahathir announced the cancellation of three BRI projects in Malaysia, including the “East Coast Rail Link” (ECRL) and two pipelines. These projects were to be built by Chinese companies as part of the Belt and Road initiative. The Malaysian government had already announced the suspension of these projects on July 4, 2018. This decision may be considered a renouncement of the BRI, but Malaysia remains involved in the initiative. Malaysia was one of the first states to join China’s new Silk Roads, and President Mahathir is not going to change this policy. During his meeting with Chinese President Xi Jinping in late August 2018, he said: “China’s Belt and Road Initiative will promote regional exchanges and cooperation, which will benefit all countries in the region” and stated that Malaysia was willing to actively participate in the joint construction of the new Silk Roads. Mahathir’s decision is mostly a response to a domestic political problem. Debt reduction is one of the objectives of the new government’s agenda. Malaysia’s debts, $250 billion, may worry financial markets. Mahathir, therefore, hopes to reduce national debts of his country by canceling unnecessary projects. According to the new administration, the former government may have underestimated the costs of these projects. This new railway line would cost nearly $20 billion (instead of $ 13.4 billion according to the former government)..
On July 4, the new Malaysian Prime Minister announced the halting of projects and possible renegotiations with Chinese companies. But considering the new estimates, Mahathir preferred to cancel these projects. On 4 July, the former prime minister, who lost the May 2018 elections, Najib Razak was indicted for corruption. Some members of the previous administration were reported to have received funds from 1Malaysia Development Berhad, a sovereign fund of Malaysia. The decision taken by Mahathir to cancel the BRI projects may put an end to certain practices. Mohamad Mahathir also hopes to revive the “Look East Policy” he first inaugurated in 1982. It aimed then to attract foreign investors, mostly Japan, to develop industries in Malaysia. The new “Look East Policy” would focus on creating jobs in high tech and research & develoment. Mahathir traveled to Japan on June 10-12, 2018 to discuss this topic with Shinzo Abe. One can imagine that the new “Look East Policy” can also be coordinated with the BRI. The cancellation of the rail line project in Malaysia also shows us that the development of the BRI requires more coordination among states. The decision made by Mahathir seems reasonable because it may reduce his country’s debts, but new mechanisms should be put in place to share the financial burden of BRI projects among Asian states. The creation of a China- Japan cooperation committee on rail issues is a first step, but we need to multiply this kind of initiative. 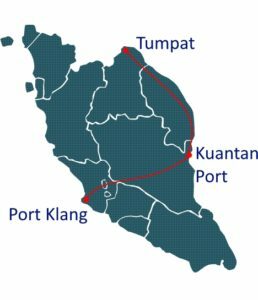 Malaysia’s Eastern Coast Rail Link is a major section of the economic corridor that is expected to link Kunming to Singapore in the long run. It is necessary that China and Asian countries strengthen their cooperation to ensure the development of these projects. Share the post "BRI projects in Malaysia, a fresh new start?"